Liverpool lost to West Bromwich Albion 2-0 at Anfield. Below is the passing network analysis for Liverpool and West Brom. More information on how these are put together is available here in my previous posts on this subject. 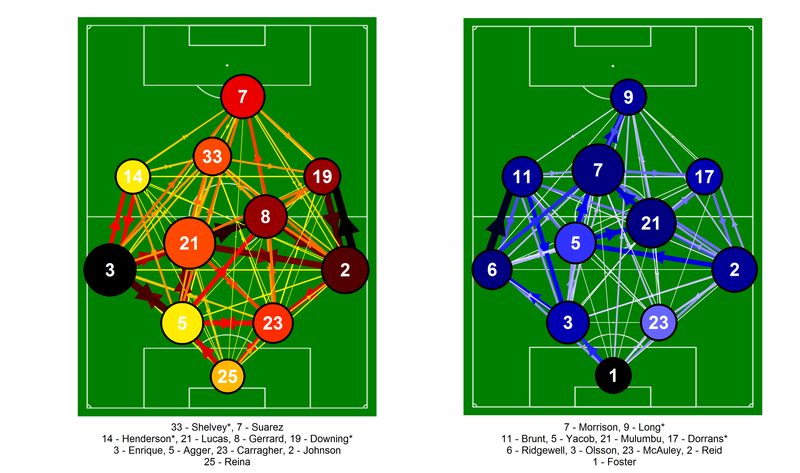 Passing network for Liverpool and West Brom from the match at Anfield on the 11th February 2013. Only completed passes are shown. Darker and thicker arrows indicate more passes between each player. The player markers are sized according to their passing influence, the larger the marker, the greater their influence. The size and colour of the markers is relative to the players on their own team i.e. they are on different scales for each team. The player markers are coloured by the number of times they lost possession during the match, with darker colours indicating more losses. Only the starting eleven is shown. Players with an * next to their name were substituted. Click on the image for a larger view. There are some contrasting features between the two sides here. Liverpool’s standard recycling of possession in deeper areas is evident, with interplay between Reina, the back four and the midfield two of Lucas and Gerrard. West Brom showed some similar features, although the link between their centre backs is much weaker than the link between Agger and Carragher. Mulumbu and Morrison were impressive for West Brom, linking well with the players around them. They formed some nice triangular passing structures with those around them, particularly with their midfield partner Yacob. Based on their passing network, West Brom passed the ball around well when they had it although Long wasn’t hugely involved (he did provide his usual nuisance value though). One of the major differences is how both sides involved their respective centre forwards. Long generally either received the ball from deeper areas e.g. the long link between himself and Foster (although many of the passes were unsuccessful) or by linking up with Morrison, who was typically the most advanced of West Brom’s central midfielders. In contrast, the link between Shelvey and Suárez is almost non-existent. Given that these two were ostensibly Liverpool’s two most attacking players, the lack of interplay between them was disappointing. With Henderson and Downing continuing on their “unnatural” sides, Liverpool’s fullbacks had plenty of space to move into down the flanks. This meant they were often a natural passing outlet for their team mates and this is highlighted by the high passing influence scores they both received. Unfortunately, much of the attacking impetus that Enrique and Johnson provided was highly wasteful. As noted on the Oh you beauty blog, their pass completion in the final third was woeful. Between them, Enrique and Johnson accounted for 30% of Liverpool’s total losses of possession. Enrique misplaced 9 passes within his own half also, as noted by WhoScored. Generally I’ve interpreted a higher passing influence score as being a good thing but perhaps in this instance this wasn’t the case. Aside from Enrique and Johnson, the main passing influence for Liverpool was Lucas. Lucas’ absolute and relative passing influence within in the team has been steadily increasing over recent matches, which is encouraging as he recovers from his injury issues. Unfortunately for Liverpool, Gerrard, Henderson and Downing had less influence than in recent weeks, which alongside the lack of partnership between Shelvey and Suárez, went some way to Liverpool struggling to open up West Brom. This entry was posted in English Premier League, Liverpool, Network Analysis, Passing and tagged EPL, Liverpool, Network analysis, Passing, West Bromwich Albion by Will Gurpinar-Morgan. Bookmark the permalink.